Michael42er has produced another of his splendid videos. This time based on the zoetrope project. 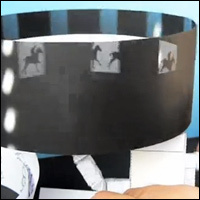 Michael has added two new animation strips to the zoetrope including adapting the original walking robot to twelve frame. Nice work Michael! Very cool indeed! Nice that someone is really making use of your models, Rob! It's like your brain is enveloping the globe. Fantastic job, Michae42er! Seeing the animation in motion is wow experience! I agree with Shelley….Congratulations Rob and Michael! 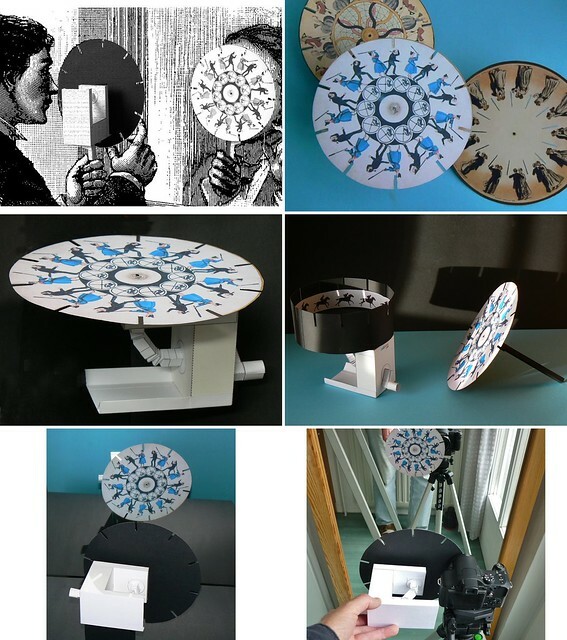 The Phenakistoscope is the predecessor of the zoetrope time. To this interesting development of the moving image can be found on www. many descriptions and pictures. And I got the idea to use the drive for the zoetrope, even for a Phenakistoscope. I have the disk image glued with a square shaft. Then one can see in a mirror, how to move the pictures. The presentation with a normal compact camera is difficult. Speed and the images per sec must match. Particularly interesting are the many images of Eadweard Muybridge with my favorites (Couple waltzing). Here, the stroboscopic effect can be seen very well. The narrow columns give a darker but sharper animation.